What Is VA Form 22-1990? VA Form 22-1990, Application for VA Education Benefits is a document used for applying for the veterans' educational benefits and assistance. The latest version of the form was released by the Department of Veterans Affairs (VA) in December 2016 and replaces the now obsolete November 2014 edition. An up-to-date VA Form 22-1990 fillable version is available for download below or can be found through on the Department of Veterans Affairs website. Post-Vietnam Era Veterans' Educational Assistance Program - or VEAP. VEAP is applicable to duty members that have joined the Army between January 1, 1977, and June 30, 1985, opened a contribution account before April 1, 1987, contributed from $25 to $2,700, completed their first period of service and were discharged or released from service under any conditions other than dishonorable. Servicemembers on active duty have the right to receive VEAP benefits if they have three or more months of contributions available. The 22-1990 can be used for a college degree and certificate programs, technical and vocational courses, licensing and certification tests, apprenticeships or on-the-job training, hi-tech training, flight training, entrepreneurship training, certain entrance examinations, and correspondence courses. It cannot be used for vocational rehabilitation and employment benefits, Marine Gunnery Sergeant John David Fry scholarship, transfer of entitlement, or national call to service. A person can apply for these benefits using other documents. Earlier, the VA Form 22-1990 could be filled through the Veteran On-Line Application service (VONAPP). This program has been retired since September 2017 and the VONAPP website is no longer available to users. How To Fill Out Va Form 22-1990? On Line" and select the "Education" option. information on VA counseling, call VA toll-free at 1-888-GI-BILL-1 (1-888-442-4551) or TDD at the Federal Relay, 711.
you may have and encourage your participation in EFT. NOTE: The numbers on the instructions match the item numbers on the application. Items not mentioned are self-explanatory. even if it has already been used to establish eligibility to a different benefit. a service-connected disability after serving at least 30 continuous days on active duty after September 10, 2001.
and October 31, 2001, and you paid $2,700. Reserve Educational Assistance Program. If you are unable to locate your copy, request a duplicate from your reserve unit. if your service began on or after January 1, 1977, and before July 1, 1985, and you contributed to a VEAP account. contributions into your VEAP account. box next to the program (only check one box) you are giving up. or call our toll-free customer service number at 1-888-GIBILL-1 (1-888-442-4551). date that you enter training. "National Test Reimbursement." You can be reimbursed for the cost of approved tests for admission to, or credit at, institutions of higher learning. EMT, CPA, MCSE, CCNP, etc. difference between what the military pays with Tuition Assistance (TA) and the total costs of these courses. dependents without properly completed forms and documentation. You can find VA forms 21-686c, 21-674, and 21-509 on-line at www.va.gov/vaforms. eligible for benefits) (38 U.S.C. § 103(c)). Additional guidance on when VA recognizes marriages is available at www.va.gov/opa/marriage. addresses of these VA Regional Processing Offices. send your enrollment information using VA Form 22-1999, Enrollment Certification, or its electronic version. Step 3. Wait for VA to process your application and notify you of its decision concerning your eligibility for education benefits. Step 2: Wait for VA to process your application and notify you of its decision concerning your eligibility for education benefits. matching programs with other agencies. can call 1-800-827-1000 to get information on where to send comments or suggestions about this form. Chapter 1606, or Chapter 1607). • I may not receive more than a total of 48 months of benefit entitlement under two or more of the education programs listed on this application. remaining under Chapter 30 on the effective date of my election. I was eligible for the kicker at the time I applied and I relinquished that benefit for the Post-9/11 GI Bill-Chapter 33. • When choosing the effective date below, I understand that benefits for training under Chapter 33 are not payable prior to that date. 12. ARE YOU NOW ON TERMINAL LEAVE JUST BEFORE DISCHARGE? ACTIVE DUTY FOR THIS PERIOD? which you would like them applied. Chapter 33 even if it has already been used to establish eligibility to a different benefit. The 22-1990 Form can be filed and submitted online through the Veterans Benefits Administration Education and Training website. If a candidate needs planning individual educational and career goals, the VA can offer a variety of counseling services to help them with their decision. These services include educational and vocational guidance together with the necessary testing to determine the candidate's skills, talents, and interests. For more information on VA counseling call 1-888-GI-BILL-1 or 1-888-442-4551. The candidate should provide their personal data, select the benefits being applied for, as well as the type and program of education or training. Other information includes service, education and employment details, marital and dependency status along with the entitlement to and usage of any additional types of assistance. Step 1. Mail the completed application to the VA Regional Processing Office for the region of that school's physical address. Step 2. Approve the request for VA education benefits with the veteran officials at the chosen school or training establishment. These will officials will have to provide your enrollment information to the VA using the VA Form 22-1999, Enrollment Certification, or its electronic version. Step 3. Wait for the department to process the document and to send the notification of its decision concerning the candidate's rights for education benefits. Step 1: Mail the completed application to the VA Regional Processing Office for the region of their home address. Step 2: Wait for VA to process the document and deliver a notification of its decision concerning the candidate's rights for education benefits. VA Form 22-1990E, Application for Family Member to Use Transferred Benefits is a form used to apply for a Transfer of Entitlement (TOE) to dependent family members and is filed by servicemembers eligible to transfer benefits to their dependents. The servicemember's military branch should approve the request to transfer benefits. The VA Form 22-1990e cannot be used for claiming the servicemember's own benefits. VA Form 22-1990T, Application for Individualized Tutorial Assistance is used to apply for supplemental payments for tutorial assistance. The subject must be necessary for the completion of the VA-approved program. The candidate should be training at least one-half of the time of a post-secondary program at an educational institution to be eligible to receive assistance. 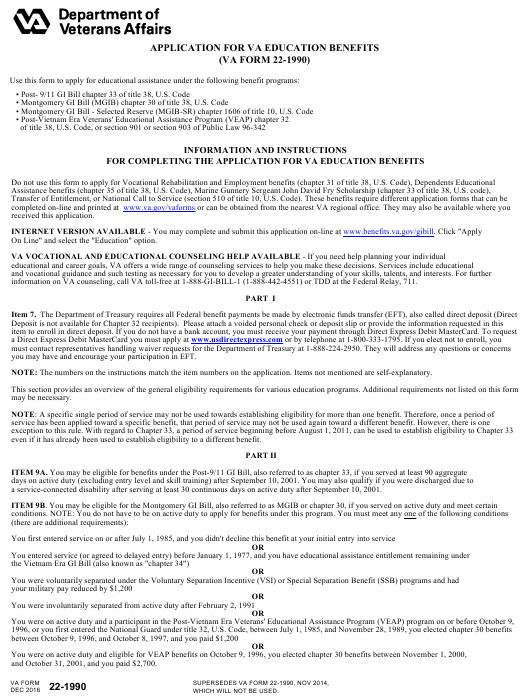 VA Form 22-1990N, Application for Va Education Benefits Under the National Call to Service (NCS) Program is used to apply for education benefits under the National Call to Service (NCS) program.